Prophet River Hotsprings Provincial Park is located along the shores of the Prophet River. 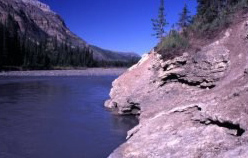 This wilderness park, accessible by hiking, horse or helicopter, is surrounded by the Eastern Muskwa Ranges and protects locally significant hotsprings. The tufa mound created by mineral deposits from the springs is surrounded on one side by stands of black spruce that thin out to the alpine of the surrounding mountains. Adventurous visitors to this park will be rewarded with scenic vistas and wonderful wildlife viewing opportunities. Prophet River Hot Springs Provincial Park is located in the upper reaches of the Prophet River some 60 km west of the Alaska Highway and about 250 km northwest of Fort St. John. The area is not accessible by road, but there is a horse/hiking trail up the Prophet River and from Redfern-Keily Provincial Park. History: The area was identified in the Fort Nelson Land and Resource Management Plan in 1997 as a Protected Area. In 1999, the area was subsequently designated as a provincial park. Cultural Heritage: Prophet River First Nations traditional use. Conservation: The primary role of Prophet River Hotsprings Provincial Park is to protect the sensitive hotsprings habitats and the abundant diversity of wildlife associated with those habitats. The park is located within the Eastern Muskwa Ranges adjacent to the Prophet River, which has been provincially designated as a Heritage River. Wildlife: A diverse variety of wildlife species utilize the area. Examples of large mammals include Stone’s sheep, moose, caribou, elk, mountain goat, grizzly bear, black bear, and wolves. There are opportunites for viewing wildlife. Stones Sheep, Elk, Moose, Deer, Black Bear and Grizzly Bear frequent the area.